Ola UK offered free rides to passengers on the first day of its operation. The humble auto rickshaw, a common sight on Indian roads, and a convenient and economical means of transport over short distances is making its presence felt in the UK. India’s ride hailing taxi service Ola Cabs, has recently launched auto rickshaws from Bajaj and Piaggio in Liverpool, UK in a bid to overtake Uber. 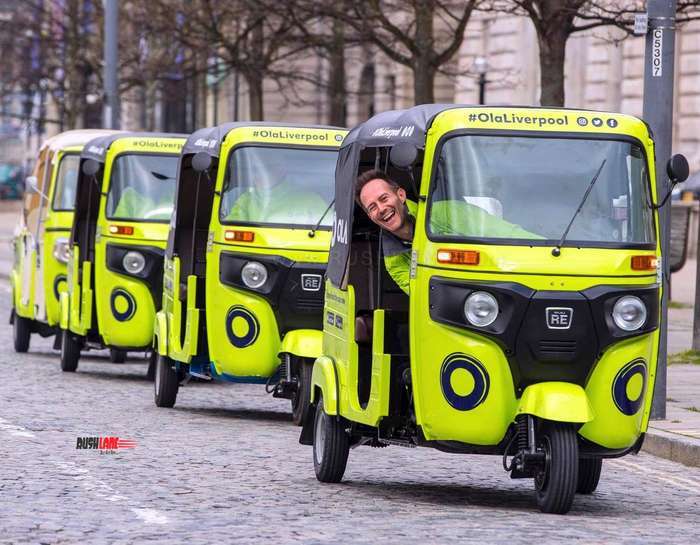 Passengers were given a ride around the Liverpool City Center in these auto rickshaws by Managing Director of ride-hailing giant, Ben Legg, on the day of launch. The auto rickshaws are seen painted in bright neon green color scheme with a black soft top, while drivers also wear neon green jackets. The use of these auto rickshaws in how they will help passengers tackle certain issues where commuting was concerned were also discussed. The travelling community of the city welcomed in this new mode of travel and new technology. Besides offering free rides to commuters on the first day of operation, a special introductory offer marked the entry of Ola into Merseyside which includes a 50 percent discount for customers who download the app before the end of April 2019 which is available via Google Play or the App Store. Ola has also stated that it will offer its drivers highest rates and charge 10 percent commission to black cabs as compared to 25 percent charged by other competitors. Ola started operations in Cardiff, UK in August 2018 after which operations spread to Bristol in October and then on to Bath and Exeter in November. Liverpool is the fifth place of operations for Ola in UK. One of the major differences between Ola and Uber in UK is that the former works with private hire drivers and hackney carriage drives. Ola has also granted licenses in each of the Merseyside boroughs and there are a total of 500 drivers working around the city.